Wakame – Love at first bite! 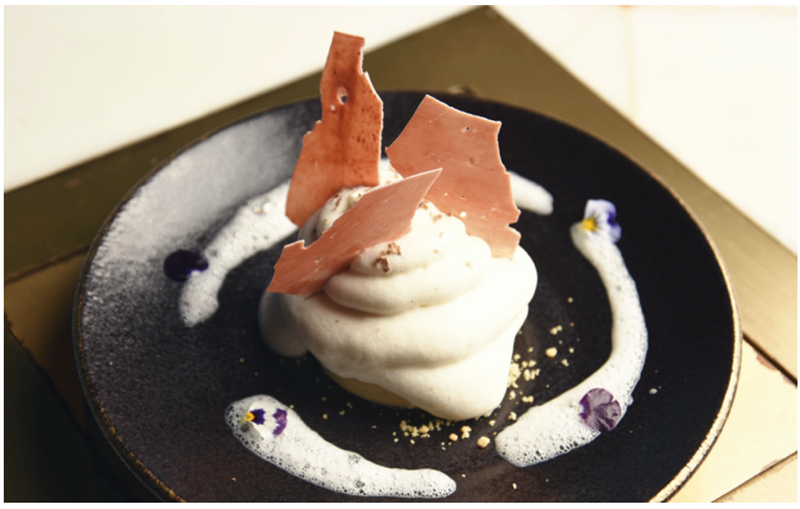 The Wakame culinary experience explores the tastes and traditions of Asia with a menu prepared by their masterful team of expert chefs and set within a contemporary yet evocatively inviting space located within the Sofitel Downtown Dubai. Anchored around the sushi and dim sum counters that immediately catch the eye upon entering, imaginations will wander towards the Far East watching the Wakame chefs work with the freshest authentic produce, culminating in a range of signature dishes using traditional techniques and ingredients reflecting the best of Asia. Dining at Wakame will evoke all five senses, introducing an exciting combination of textures and flavors, from small sharing plates to large plates and exquisite desserts. With a dedicated bar area, Wakame offers an exuberant selection of beverages, each of which yields its own unique story. They also have a resident DJ who sets the tone for afterhours socializing, with a service reflecting true Asian hospitality; promising guests a truly unforgettable experience! We started off with some beverages to set the tone for the indulgence. 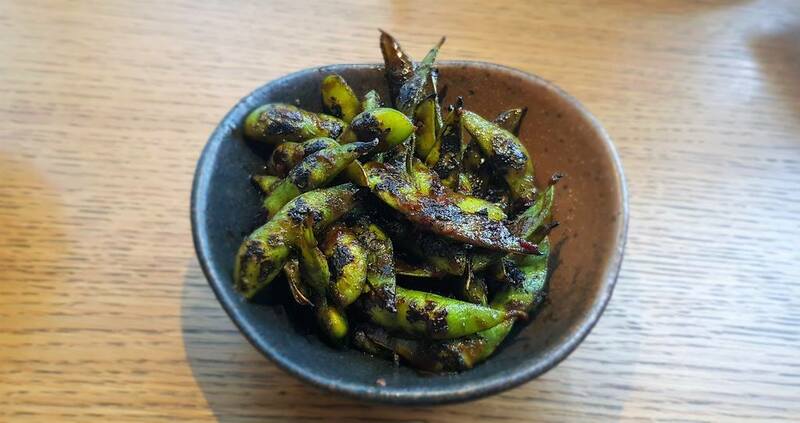 We were served with Spicy Edamame with chilli, oyster sauce & ginger. Have tried Edamame in so many Asian restaurants but this one was different from anything I tasted. It had a unique character, flavour and personality to it. Even a simple dish like Edamame comes out as a stand out delicacy from the Wakame kitchens. 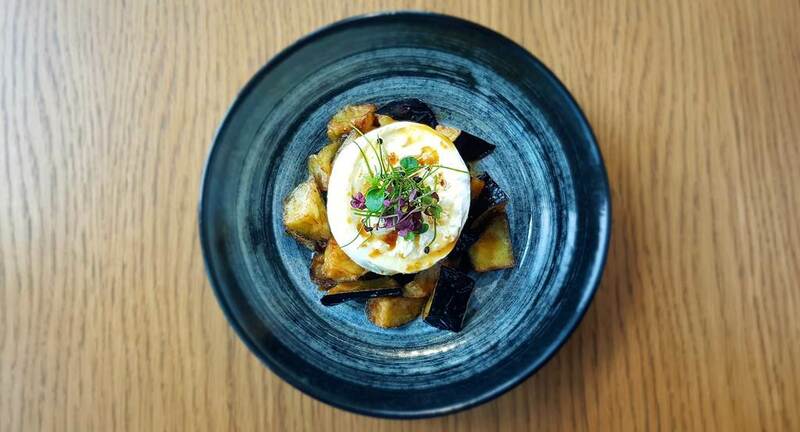 In Salads we had Crispy Japanese Eggplant & Burrata which was light stir fried eggplant with burrata & yuzu tru­ffle. Probably one of the best Eggplant dish I’d ever tasted, it was simply yummy and just melted in the mouth. Add to that the soft yuzu truffle was a great pairing which made the dish a standout appetizer. This dish already won our hearts and gave us a sense of the culinary finesse of the chefs of Wakame and raised our expectations from the dishes to follow. This was more like a miniature version of a gourmet pizza with perfect portions of Cream Cheese, Jalapeno, Red Onion, Cherry Tomato & Truffle Sauce. Again another stand out dish truly appetizing! 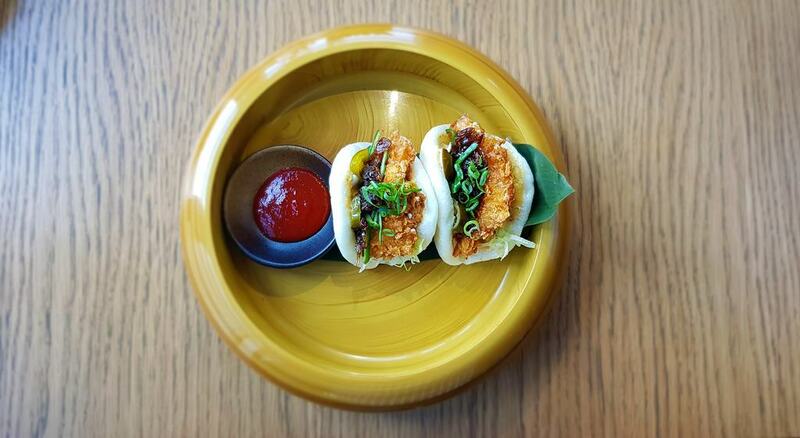 Light crispy Shrimp wrapped in soft Bao Bun which sent the sensations of the palettes on a roller coaster ride. It was simply a brilliant explosion of a dozen different contrasting flavours done in a tasteful manner. It was bit sweet, bit tangy, bit sour – a delightful bit of everything. Crabs are best enjoyed in its primal form and things do get messy, but since I was in the middle of a business hop, I kept to Soft Shell crab – easier on the hands and clothes!! It was delightfully crispy and nice to eat. With the Wasabi Mayonnaise & Sweet Ponzu dip on side, it served as a complete feast for the palettes. Salmon rose, chopped spicy salmon, and tempura crumb. Literally it was a gentle looking explosive dish that ignited the palettes. Thanks to the nice inclusion of Tempura crumb which kind of added a texture and crunch to the thin and soft slice of Salmon. Grilled jumbo prawns smothered in flavorsome chilli butter sauce. Another standout dish that feasted the senses in every sense of the word. In Desserts we had Lavariya Bar - a dark chocolate bar with grated coconut inside and paired with St. Clairs tea ice cream. A remarkable dessert and a feast for chocolate lovers who like the coco-choco combination - (read bounty fans). fondant with white chocolate centre and paired with matcha ice cream. We went in the middle of a week day so the restaurant was largely empty. The interiors have a very contemporary look and feel and the setting is perfect for a business lunch or a casual catch up. The classy interiors are accentuated with chandeliers and artistic lighting. Despite the maddening traffic outside, the interiors were totally calm and relaxed. 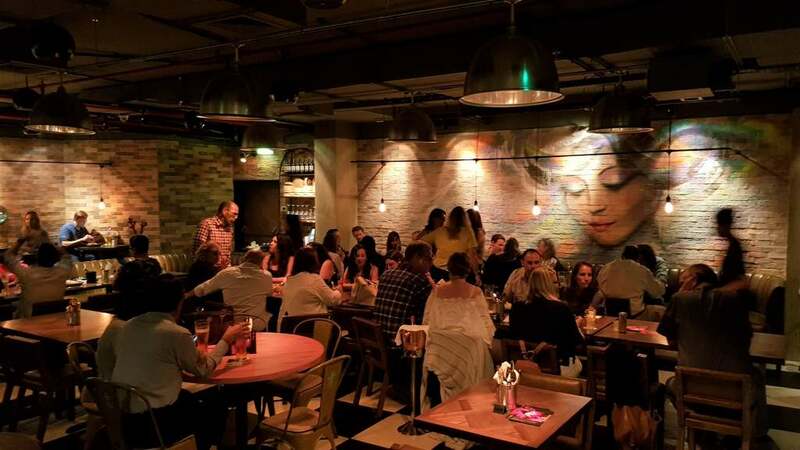 Tables by the windows offered unobstructed views of the buzzing traffic on the arterial sheikh Zayed road. We were totally impressed by the service. Our table was served by Marc, a South African waiter. He was prompt, attentive, very friendly and polite. The service was on par with any top 5 star hotel in Dubai. He always carried a gentle and pleasant smile on his face and kept a watch over us, in a non-intrusive manner of course, to make sure that our orders or needs were promptly attended to. 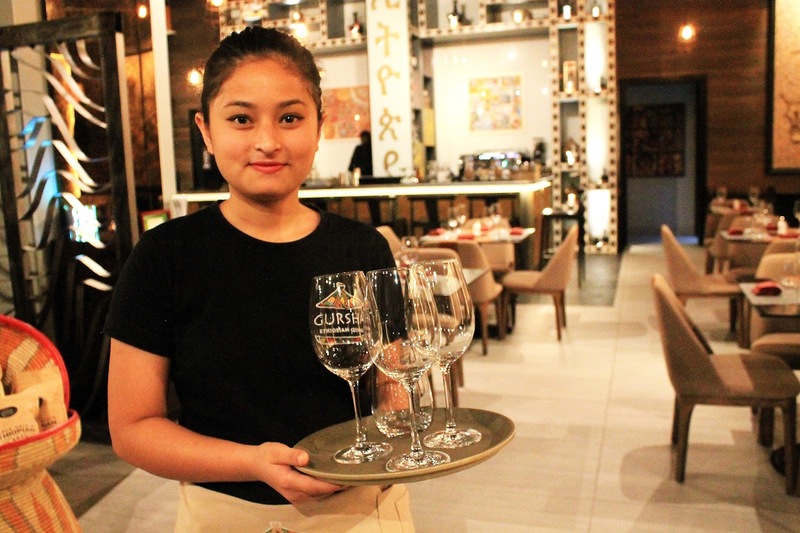 We met the super friendly, experienced and humble restaurant general manager who took time to sit with us to find out about our experience and also hear our comments and feedback on how they could improve on anything. We also gathered a lot of insights about the company, the founder and the industry in general in our chat with him. A great manager only can lead a great team and we understand why Marc is as amazing as he is! We also met Shane Silva the head chef who was kind enough to serve us a very carefully selected assortment of dishes that afternoon. I have already heard lots about this interesting and talented young man from other bloggers in Dubai and I was happy to be able to finally meet this culinary genius. The pricing is definitely on the higher side but great taste, quality and finesse comes at a price, of course. Wakame is probably the Hakkasan for Japanese food. Overall the place impressed on every count and we enjoyed every bit of our experience in this restaurant. This place absolutely deserves a 5. Top class food. Top class service. Standout presentation. Excellent team of chefs and servers and a great general manager who leads it all.